So this weekend I have managed to get away from uni stress and went to my gorgeous friend Megan's (Meg's Budget Boutique) birthday weekend. It involved a five hour journey (train and coach) each way to get there, which was the slight downfall but my friend Lydia was my much needed travel companion. I had a lovely time, seeing my 'besties' and we had such a laugh. 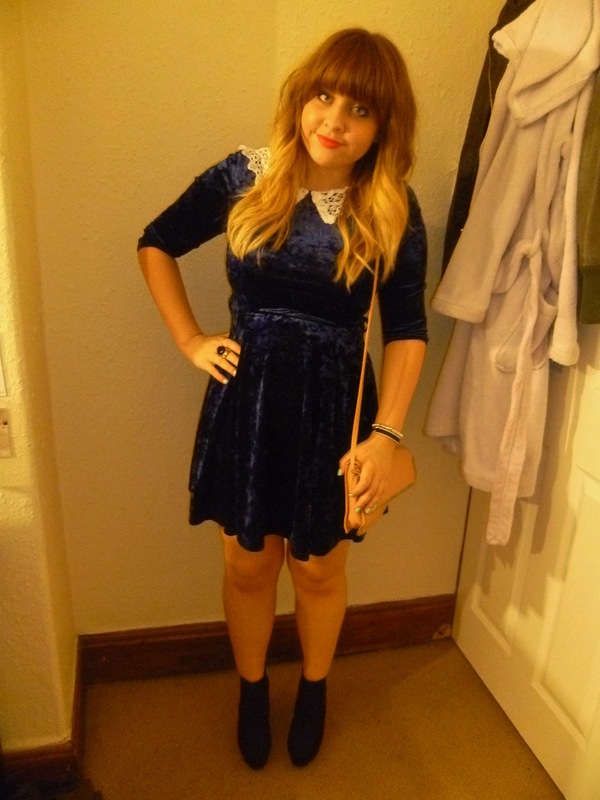 I thought I would show you what I wore on Saturday night when we went out. I really like this blue velvet skater dress but I wanted to add a collar, so with some lace and my mum's brilliant skills, I enhanced the dress with a cute peter pan collar! I had a lovely weekend but now I have to crack on with horrible uni essays before I break up for Christmas. Did you all have good weekends and who else likes to alter clothes like me? I love the collar that you added, definitely gives the dress a little something extra! Glad you had a good weekend, I hate long train journeys, it's always better when you have someone with you! I love the dress and very clever adding the collar!